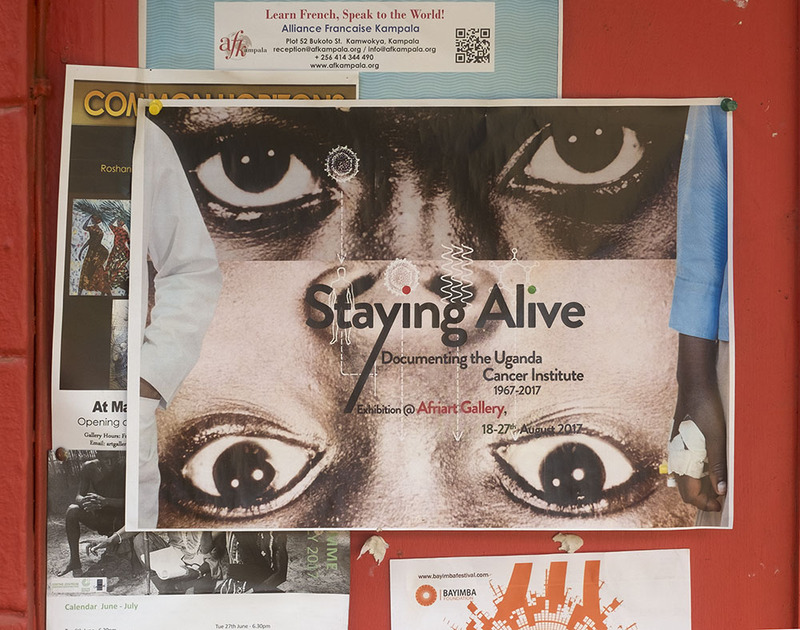 Last Friday the Staying Alive book was launched with an exhibition at Afriart Gallery in Kamwokya. Below you find documentation of the evening including the moving and informative speech delivered by Prof. Olweny, former director of the Uganda Cancer Institute, after receiving ‘the first copy’ of the publication. 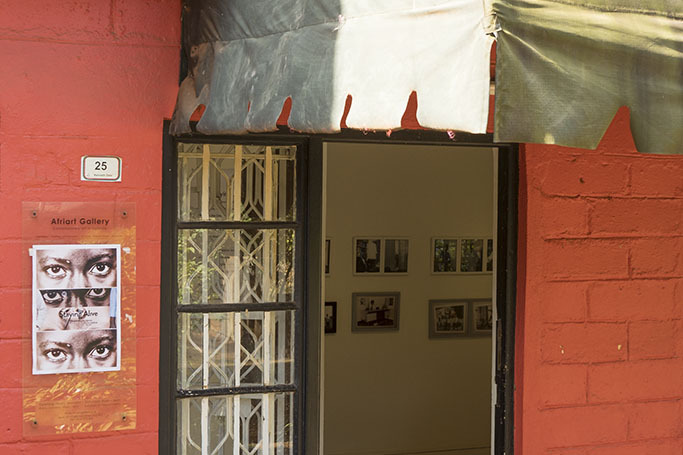 The exhibition can be visited daily between 9am and 6pm until Saturday the 26th of August 2017. Over the past 15 years we have had many exhibitions in this gallery. They included photography, but we never had a show like this, showing among others historical medical pictures. We are very happy to be able to present new art that is finding new audiences and welcome you all here. Sebastian Kyalwazi was the first surgeon practicing in the whole of the East African region. His first posting in Uganda was in Mbale hospital. I was a medical student then. He got a scholarship and went to Czechoslovakia, did some training in oncology and got very interested in it. When the idea to start the Cancer Institute came up, Paul Carbone discussed this with Sebastian Kyalwazi, and it worked out very well. The following year, in ’67 the centre was founded. An 18 bed ward treating childhood lymphomas, mostly Burkitt’s lymphoma and Hodgkin’s disease. This is true. Dennis Burkitt had only one eye. But where did Ian McAdam’s remark on the camera come from? They were seeing children with Burkitt’s Lymphoma, but at that time nobody knew what it was. Some children were presented with jaw swellings, others presented with abdominal swellings, others presented with swellings in their legs. People thought these were all different diseases. ‘no! I think these are one and the same disease presented in different areas’. He then bought himself a camera and drove around the whole continent of Africa. He had pictures of children with this swelling, some in the tummy, some in the jaw. He was not far off. Because of his creativity, his thoughtfulness, in 1964 at an international conference in France it was unanimously agreed that this disease was called Burkitt’s lymphoma. And it still is Burkitt’s lymphoma today. I thank you for those pictures. They bring back memories. Each time I look at them I feel like shedding tears. Yet I have to hold back. It is wonderful to see the Cancer Institute changing. Unfortunately most of the people look at the negative side. Oh, the radio therapy machine is broken down. Yes! But the Cancer Institute became world famous without a radio therapy machine. So why are we concerned about radio theraphy now if it became world famous before a radio therapy machine ever came to Uganda? It became famous because of people like you and me. Doctors, nurses, technicians, all working together. It became famous because we were able to show that Burkitt’s lymphoma could be cured. We were able to show that Hodgkins’ disease could be cured by drugs alone. We were able to show that Kaposi Sarcoma can be treated and cured. We were able to show that liver cancer can be treated with drugs alone. Those were the good old days. Now it is most impressive, most rewarding to still be here. To see the Fred Hutch Centre. To see the six level cancer ward up on the hill with one hundred beds for cancer patients. To see the development of East African oncologists and without You, this would not be a reality. I am indeed humbled to see what went before us. And I hope it will continue. Read more and see more photographs of the evening on the website of the Independent.